IndustriALL’s affiliates in Uruguay, Argentina and Brazil participated in a day of action held simultaneously in the three countries in support of the Brazilian president, Dilma Rousseff, democracy and the rule of law. 31 March was a day of action and struggle. 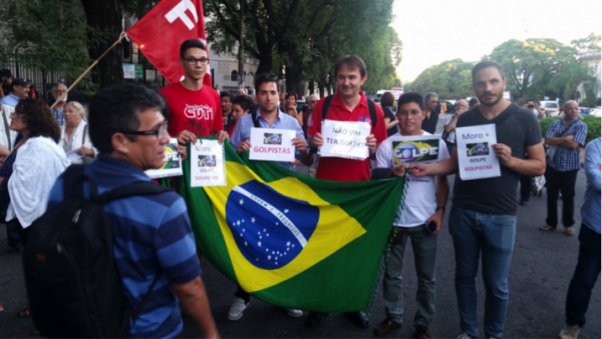 In Uruguay, demonstrators, including members of IndustriALL Global Union affiliates, the PIT-CNT and other social movements, protested in front of the Brazilian embassy. In Argentina, demonstrators gathered in front of the Obelisk and marched to the Brazilian embassy. In both countries, protestors personally delivered letters of support for Dilma Rousseff and former president, Luiz Inácio da Silva. The biggest protests were in Brazil. Demonstrations were held simultaneously in all of the country’s 27 states to express support for President Dilma Rousseff’s government and former president Lula da Silva. Demonstrators protested at “the coup”, alluding to threat to impeach the president. They emphasized their commitment to democracy and the rule of law and opposition to those who are planning to impeach the president without any legal basis. The day on which action was organized was not chosen by chance. The 31 March was the 52nd anniversary of the military coup that established a 21-year dictatorship in Brazil. Many sectors of society in these countries went out on to the streets to demonstrate their opposition to the political procedure that aims to overturn a legitimately elected government. They declared their will to fight against the coup and defend democracy, rights and a better Brazil.